U.S. stocks inched higher as Apple's strong earnings reported on Wednesday proved to be not enough to ease fears over an escalating tension between Russia and Ukraine. Reports surfaced of escalated troop movements in Ukraine while Russia began military drills near the Ukraine border. After trading higher by 39 points and lower by 49 points the Dow ended the day little changed. The S&P 500 also ended the day little changed while the Nasdaq index outperformed. 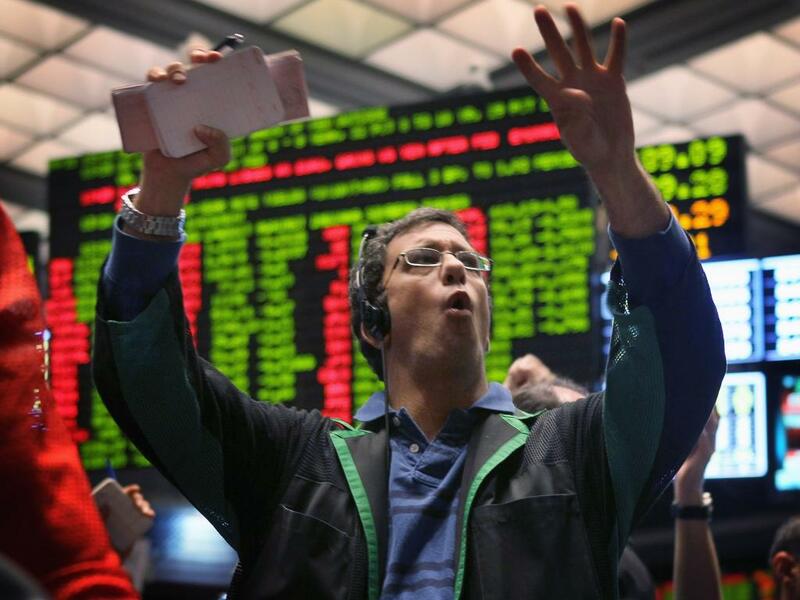 The S&P 500 gained 0.17 percent, closing at 1,878.61. 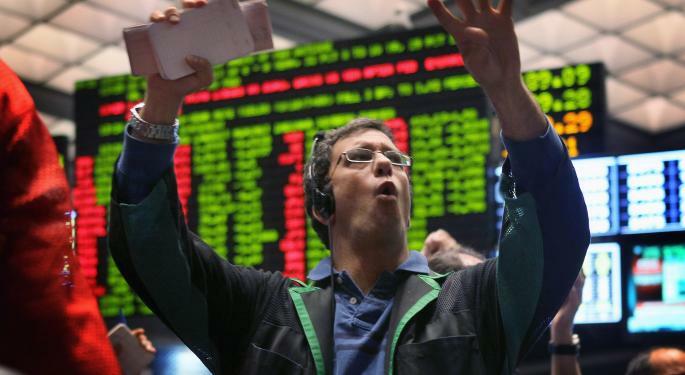 The Nasdaq gained 0.52 percent, closing at 4,148.34. Gold gained 0.64 percent, trading at $1,292.80 an ounce. Oil gained 0.51 percent, trading at $101.96 a barrel. Silver gained 1.30 percent, trading at $19.69 an ounce. Initial Jobless Claims rose 24,000 to 329,000, above the consensus of 313,000. Continuing claims declined 61,000 to 2.68 million. March Durable Goods rose 2.6 percent, ahead of the 2.0 percent expected and 2.1 percent in February. The Bloomberg Consumer Comfort Index rose to -25.4 from -29.1 for the week ended April 20. EIA Natural Gas Inventory rose 49 bcf, compared to a rise of 24bcf last week. April Kansas City Fed Manufacturing Survey declined to +7.0 from +10.0 in March, missing expectations of 8.0. The FDA will unveil a series of proposals to regulate e-cigarettes which include a requirement for manufacturers to gain approval from the agency to sell their products. Analysts at Bank of America maintained a Neutral rating on Apple (NASDAQ: AAPL) with a price target raised to $615 from a previous $590. Analysts at Nomura and Barclays also maintained Neutral ratings on Apple with price targets raised to $574 (from a previous $545) and $590 (from a previous $570), respectively. Meanwhile, analysts at CLCSA upgraded Apple to Buy from Outperform. Shares gained 8.20 percent, closing at $567.77. Analysts at Nomura maintained a Buy rating on Biogen (NASDAQ: BIIB) with a price target raised to $415 from a previous $413. Shares lost 3.88 percent, closing at $294.84. Analysts at Imperial Capital Maintained an Outperform rating on Delta Air Lines (NYSE: DAL) with a price target raised to $48 from a previous $42. Shares hit new 52-week highs of $37.47 before reversing gains and losing 0.97 percent, closing at $36.73. Analysts at Barclays maintained an Equal-weight rating on Dr Pepper Snapple (NYSE: DPS) with a price target raised to $56 from a previous $52. Shares lost 1.20 percent, closing at $53.83. Analysts at Bank of America reiterated a Buy rating on Facebook (NASDAQ: FB) with a price target raised to $84 from a previous $82. Also, analysts at Stifel reiterated a Buy rating on Facebook with a price target lowered to $80 from a previous $82. Shares lost 0.80 percent, closing at $60.87. Analysts at Bank of America maintained a Neutral rating on Fusion-io (NYSE: FIO) with a price target lowered to $11 from a previous $12. Shares lost 10.80 percent, closing at $8.64. Analysts at Goldman Sachs upgraded Goodyear Tire & Rubber (NYSE: GT) to Conviction Buy from Buy with a price target raised to $36 from a previous $33. Shares hit new 52-week highs of $28.48 before closing the day at $28.20, up 3.22 percent. Analysts at Sarasin downgraded IBM (NYSE: IBM) to Neutral from Buy. Shares lost 0.74 percent, closing at $190.31. Analysts at Nomura maintained a Buy rating on Lululemon Atheltica (NASDAQ: LULU) with a price target lowered to $55 from a previous $70. Shares lost 0.86 percent, closing at $47.10. Analysts at Bank of America maintained a Buy rating on Merck (NYSE: MRK) with a price target raised to $62 from a previous $57. Shares gained 0.05 percent, closing at $57.53. Analysts at Bank of America reiterated a Neutral rating on Owens Corning (NYSE: OC) with a price target lowered to $44 from a previous $46. Shares lost 0.81 percent, closing at $41.75. Facebook (NASDAQ: FB) announced that it has purchased ProtoGeo, a developer of fitness-tracking app Moves. ProtoGeo has no plans to “commingle” its data with Facebook and will continue working on its standalone app. Shares lost 0.80 percent, closing at $60.87. Recommended: Facebook Earnings Breakdown: After A Blowout Quarter, Could The Momentum Continue? Endgaget reported that Google's (NASDAQ: GOOG) Glass was briefly available for purchase due to a possible glitch in the ordering sites. However, Endgaget updated that customers not already “in the pipeline” will not be receiving one, even those who successfully placed an order. Separately, Google+ boss Vic Gundotra will leave Google after an eight-year stint. Shares lost 0.34 percent, closing at $525.16. Actvais (NYSE: ACT) announced that it has entered into an agreement with Pfizer (NYSE: PFE) to settle all outstanding patent litigation related to Actavis' generic version of Celebrex. Shares of Actavis lost 0.42 percent, closing at $202.66 while shares of Pfizer lost 0.65 percent, closing at $30.72. AstraSeneca (NYSE: AZN) hinted that it could spin off $15 billion of non-core assets in the near future. Shares hit new 52-week highs of $70.71 before closing the day at $69.01, up 1.81 percent. The Chinese government has revoked Sina's (NYSE: SINA) online publishing and video licenses after Sina's article and video library was found to contain pornographic content. Sina will have the opportunity to repeal the decision and the company is fully operational for the time being. Shares lost 3.06 percent, closing at $51.64. Coca-Cola (NYSE: KO) named Kathy Waller as the company's new CFO, effective immediately. Waller is replacing the outgoing Gary Fayard who is retiring from the company. Shares lost 0.05 percent, closing at $40.71. Bill Ackman's Pershing Square issued a press release highlight Wednesday's Herbalife (NYSE: HLF) story on ABC's Nightline. Shares lost 0.16 percent, closing at $57.58. In a blog post the Federal Trade Commission argued that it is bad policy for consumers to be forced into car dealerships to purchase a car. The agency stated that Tesla (NASDAQ: TSLA) poses no serious competitive threat to the established dealer network and that “efforts to litigate, legislate, and regulate to eliminate Tesla's perceived threat have forced it to battle jurisdiction-by-jurisdiction for the simple right to sell its automobiles directly to consumers.” Separately, according to Want China Times, Tesla will team up with JA Solar (NYSE: JASO) to build a charging station network in Shanghai. Shares of Tesla lost 0.06 percent, closing at $207.86 while shares of JA Solar gained 4.98 percent, closing at $11.38. This morning, Aetna (NYSE: AET) reported its first quarter results. The company announced an EPS of $1.98, beating the consensus estimate of $1.52. Revenue of $14 billion beat the consensus estimate of $13.69 billion. Net income for the quarter rose to $665.5 million from $490.1 million in the same quarter last year as the company saw its medical membership grow by 529,000 members to over 22.7 million. This marks the eighth consecutive quarter of membership growth for the company. Aetna raised its full-year operating earnings forecast to a range of $6.35 to $6.55 from a previous guidance of $6.25 per share. Shares hit new 52-week highs of $73.98 before closing the day at $72.94, up 5.85 percent. This morning, D.R. Horton (NYSE: DHI) reported its second quarter results. The company announced an EPS of $0.38, beating the consensus estimate of $0.34. Revenue of $1.7 billion beat the consensus estimate of $1.55 billion. Net income for the quarter rose to $131.0 million from $110.0 million in the same quarter a year ago as net sales orders increased 20 percent in value to $2.4 billion and homes closed increased 23 percent in value to $1.7 billion. Home sales gross margin increased 210 basis points to 22.5 percent. Shares gained 8.34 percent, closing at $23.13. Recommended: Are Gold ETFs Currently A Buy? Zimmer Holdings (NYSE: ZMH) has agreed to purchase Biomet, a fellow orthopedic device marker for $10.35 billion in cash and $3 billion in stock. Zimmer said that the transaction will “position the combined company as a leader in the $45 billion musculoskeletal industry” and that “the complementary nature of the two business adds diversity and scale across various geographies and product categories.” Shares hit new 52-week highs of $108.33 before closing the day at $102.00, up 11.54 percent. Elizabeth Arden (NASDAQ: RDEN) has hired Goldman Sachs bankers to explore a potential sale of the company. Shares gained 13.10 percent, closing at $36.00. This morning, Russian based Yandex (NASDAQ: YNDX) reported its first quarter results. The company announced an EPS of $0.23 and revenue of RUR10.9 billion ($305.0 million). Net income for the quarter rose six percent to RUR2.7 billion ($75.1 million) from a year ago as the company benefited from foreign exchange rates which partially offset higher development costs. Yandex also operates in Ukraine, Belarus, Kazakhstan and Turkey expects to see ruble-based revenue growth of 25 percent to 30 percent versus a consensus of 29 percent growth. Shares lost 5.57 percent, closing at $26.68. This morning, Under Armour (NYSE: UA) reported its first quarter results. The company announced an EPS of $0.06, beating the consensus estimate of $0.04. Revenue of $642 million beat the consensus estimate of $598.78 million. Net income for the quarter rose to $14 million from $8 million in the same quarter a year ago as the company saw broad-based strength across all categories. Despite the mostly positive quarter, the company forecast its full year revenue to be $2.88 billion to $2.91 billion, in line with analyst expectations, but investors interpreted these projections as meaning decelerating growth. Shares lost 7.40 percent, closing at $50.40. This morning, Swiss based Novartis (NYSE: NVS) reported its first quarter results. The company saw its net sales rise one percent year over year to $14.0 billion, falling short of estimates of $14.25 billion. The company earned a core EPS of $1.31. Operating income rose to $3.49 billion from $2.85 billion in the same quarter last year as the company benefited from a $0.9 billion pre-tax gain from the divestment of its blood transfusion diagnostics unit. Sales of medicines that were launched in 2009 or later rose 17 percent to $4.3 billion, of note sales of Galena rose 31 percent year over year to $552 million. Novartis affirmed previous guidance that its 2014 sales will increase by a low to mid single digit percentage basis. Shares lost 1.83 percent, closing at $84.59. This morning, Dunkin' Brands Group (NASDAQ: DNKN) reported its first quarter results. The company announced an EPS of $0.33, missing the consensus estimate of $0.35. Revenue of $171.9 million missed the consensus estimate of $172.19 million. Net income for the quarter fell to $23.0 million from $23.8 million in the same quarter a year ago as sales in the U.S. were “significantly” impacted by severe weather in the regions of the country where the company has its largest exposure. The company added 96 net new restaurants worldwide including 69 in the U.S. Shares lost 1.89 percent, closing at $46.69. This morning, Time Warner Cable (NYSE: TWC) reported its first quarter results. The company announced an EPS of $1.78, beating the consensus estimate of $1.68. Revenue of $5.58 billion missed the consensus estimate of $5.64 billion. Net income for the quarter rose to $479 million from $401 million in the same quarter a year ago as Internet subscriber gains offset losses in cable TV. The company added 269,000 new broadband customers and saw 34,000 video customers close their accounts. As a whole, average monthly revenue per residential customer rose 0.6 percent to $105.45 while high-speed data average monthly revenue per user rose 8.7 percent to $46.32. Shares gained 0.38 percent, closing at $140.40. This morning, Eli Lilly (NYSE: LLY) reported its first quarter results. The company announced an EPS of $0.70, missing the consensus estimate of $0.71. Revenue of $4.68 billion missed the consensus estimate of $4.78 billion. Net income for the quarter plunged to $727.9 million from $1.55 billion in the same quarter a year ago as the company saw a substantial decline in revenue and earnings as the result of U.S. patent expiration for Cymbalta and Evista. The company updated its outlook and estimated its EPS will come in a range of $2.72 to $2.80 (unchanged from previous guidance) on revenue of $19.4 billion to $20 billion (from a previous range of $19.2 billion to $19.8 billion.) Shares lost 1.48 percent, closing at $58.68. This morning, 3M Company (NYSE: MMM) reported its first quarter results. The company announced an EPS of $1.79, missing the consensus estimate of $1.80. Revenue of $7.83 billion missed the consensus estimate of $7.96 billion. Net profit for the quarter rose to $1.21 billion from $1.13 billion in the same quarter a year ago as the company saw gains in its Healthacre, Industrial, Safety & Graphics, Electronics & Energy and Consumer divisions. Sales in Asia Pacific grew the most in a percentage basis by 6.9 percent with Latin America and Canada growing by 6.8 percent. The company reaffirmed its prior outlook for the full year fiscal 2014 and sees its EPS to be in a range of $7.30 to $7.55, versus a consensus estimate of $7.46. Shares lost 0.97 percent, closing at $136.65. This morning, Caterpillar (NYSE: CAT) reported its first quarter results. The company announced an EPS of $1.61, beating the consensus estimate of $1.22. Revenue of $13.24 billion beat the consensus estimate of $13.14 billion. Operating profit for the quarter rose to $1.398 billion from $1.22 billion in the same quarter last year as the company benefited from lower manufacturing costs, decreased SG&A and R&D expenses and the favorable impact of foreign exchange rates. Machinery sales declined 12 percent, with most regions reporting declines of 20 percent ore more, although North American sales rose six percent. Caterpillar sees its full year fiscal 2014 EPS to be $6.10, higher than previous guidance of $5.85 and a consensus estimate of $5.93. The company's revenue projection of $56 billion is unchanged and slightly below the consensus estimate of $56.2 billion. Shares hit new 52-week highs of $107.40 before closing the day at $105.28, up 1.84 percent. After the market closed, Las Vegas Sands (NYSE: LVS) reported its first quarter results. The company announced an EPS of $0.97, beating the consensus estimate of $0.94. Revenue of $4.01 billion beat the consensus estimate of $3.88 billion. Shares were trading higher by 0.65 percent at $80.00 following the earnings release. After the market closed, Pandora Media (NYSE: P) reported its first quarter results. The company announced an EPS of -$0.13, beating the consensus estimate of -$0.15. Revenue of $180.1 million beat the consensus estimate of $174.94 million. Shares were trading lower by 6.38 percent at $26.40 following the earnings release. After the market closed, Microsoft (NASDAQ: MSFT) reported its third quarter results. The company announced an EPS of $0.68, beating the consensus estimate of $0.63. Revenue of $20.4 billion was in-line with the consensus estimate. Shares were trading higher by 2.53 percent at $40.87 following the earnings release. After the market closed, Starbucks (NASDAQ: SBUX) reported its second quarter results. The company announced an EPS of $0.56, in-line with the consensus estimate. Revenue of $3.87 billion missed the consensus estimate of $3.95 billion. Shares were trading higher by 0.76 percent at $71.63 following the earnings release. After the market closed, Amazon.com (NASDAQ: AMZN) reported its first quarter results. The company announced an EPS of $0.23, missing the consensus estimate of $0.24. Revenue of $19.74 billion beat the consensus estimate of $19.42 billion. Shares were trading higher by 1.67 percent at $342.78 following the earnings release. "Bonuses up, profits down. Not a headline we would have chosen." - Barclays Chairman Sir David Walker speaking at the company's annual meeting. 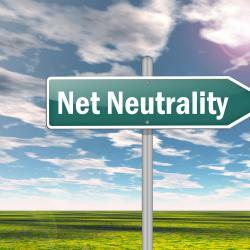 The End Of Net Neutrality, Or A New Attempt At Fairness?